Born on October 17, 1898, Gus Kuhn was competing in the motorcycle sport long before speedway racing began in England. As far back as 1919 riding a 211cc Levis he won the first-ever National Victory Trial. That same year he gained the Upton and Aston Trials Trophies and also had the distinction of making a return journey from Land's End to John o'Groats on a single geared Levis in spite of encountering heavy snowstorms en route. The little 2¼ Levis took second place in the 350, 500 and 750cc events and first in Class D in the Kop Hill Climb, near Princes Risborough on May 27, 1920, which - until the ban came in 1925 on all speed events held on public roads - remained one of the most famous of all British hill climbs. Gus gained a silver medal in that year's Victory Trial and in the flying kilometre speed trials on the Douglas promenade he made the fastest time in two classes. His thoughts now turned to road racing and in the Isle of Man TT he took seventh place in the Junior Race. The 250 class was incorporated in the same event and Gus was runner-up to R Clark who also rode a Levis. In successive years from 1922 to 1926 inclusive - apart from 1923 - he raced several makes of machines in the island. In the Lightweight TT of 1922, riding a Sun, he secured 12th place: Omega mounted, in the 1924 Ultra-Lightweight race he retired, as he also did in the 1925 Junior and Senior TT's on a Velocette and Douglass respectively. His luck was out again in the '26 Senior when on lap one his Douglas broke a chain, but fifth place in the Junior TT of the same year gave him his best-ever TT performance. He averaged 62.34 mph. Riding in the Thompson Trophy Trial of 1924 on a 249 Velocette Gus made the best performance and collected the main award as well as the Captain's Cup. On the same machine he won the Premier Trophy in the Victory Trial of '25 and in the Southern Scott Scramble on Camberley Heath he annexed second place to the great George Dance. In the Camberley Scramble held later in the year Gus, who was one of the "Big Five" among the Camberley rough riders, carried off the premier award: his mount - a 348cc Velo. He rode the snowbound course in a soft trilby hat! - conspicuous headgear in a crowd of leather helmets and tweed caps. 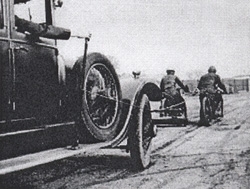 London saw its first road race meeting in May 1927, held in the Crystal Palace grounds and staged by the London Motor Sports Ltd., with Fred Mockford and Cecil Smith in charge. The same company and the same two men promoted speedway racing at the same venue the following year. Gus Kuhn took part in the inaugural road race, but success didn't come his way until the second meeting which, incidentally, attracted a crowd of 15,000 on August 6. Again, Velocette mounted, he made the fastest lap in covering the mile course in 1 min. 56 secs. and he also won the Kempton Trophy five-lap race. At the third meeting Gus made even better performances with fastest laps in two classes and the Newmarket, Goodwood and Autumn Trophies to add to his collection. And so to speedway. Gus Kuhn was in the game right from the start. Taking part in the King's Oak second meeting in 1928 he gained the 350 Grand Prix and a second to Alf Medcalf in the 500 event in the morning. In the 350 Championship race which took place in the afternoon he scored a second - to Colin Watson - on his Calthorpe. At the end of April the British Dirt-Track Riders' Association was formed with Lionel Wills, himself a rider too, as the Secretary. Gus was a member of the body's three-man committee. In the ACU Six Days' Stock Machine Trial Kuhn won a Gold Medal but previous to this Stamford Bridge's famous track with its high-banked bends provided him with many great performances. When league racing started in 1929 it was perhaps only natural that Gus should take over as skipper of the team. He led them to victory in the Southern League Championship, after a terrific struggle with Southampton and Coventry, and scored a total of 188 points out of a possible of 240. He was practically unbeatable at the "Bridge". The team held an unbeaten home record that first season, but lost three away matches to Coventry, White City and Southampton. The final match at Crystal Palace saw the "Bridge" win a tremendous battle. Gus tore out of the last bend in first place when an ardent opponent charged into his back wheel: he was sent flying, but with victory uppermost in his mind he rolled over the line in first position - minus his machine! Push starts were the order at Stamford Bridge and it soon became a bone of contention with arguments as to whether the pushers pushed hard enough! Many beaten teams went home convinced that they lost because they were not pushed off with such vigour and vim as the "Bridge" riders. Wal Phillips soon found the worth of Gus's strategy on the track, and the two formed what was destined to become one of the most famous League pairs in the history of the sport. Wal turned on that phenomenal speed of his and tore away in the lead, while Gus with characteristic skill, warded off any opponent. In 1931 Gus Kuhn had a bungalow near Selsey and after each Stamford Bridge meeting he dashed off to the seaside. His place was near the Lifeboat Station and one night he was awakened by a big explosion. Jumping out of bed and looking through the window he found it was the lifeboat rocket. Hastily dressing himself he dashed over to the station to render what assistance might be necessary but the crew apparently thought Gus's weight might overload the boat and the offer was politely refused! Fox photos 1932 "A number of attempts have been made to introduce a satisfactory starting device for speedway racing without success. Gus Kuhn, the well known Stamford Bridge rider, has now introduced a scheme which he claims is workable and this is to be officially tested." Like necessity, the false start was the mother of invention, and in April 1932, Kuhn evolved a starting device. A car pushed the machines by means of a roller to start the engines: they were then kept on the leash until the starting line was reached, then the car driver operated a release mechanism! Gus remained with Stamford Bridge until it ceased to function at the end of 1932. The team always had a say in the destination of league honours: third in 1930, second in 1931 and fourth the following year constituted an impressive record. Gus joined Wimbledon at the beginning of 1933 and stayed with them for nearly five years. Now a veteran, at the age of 38, he was one of the oldest riders in the sport. Affectionately called "Old Father Gus" he rode for the "Dons" with all the ardour and skill at his command. He fought for them with all the determination of a man who was struggling not only to preserve a name that was famous in the game, but for the honour of the team to which he belonged. August 1937 saw him as a Wembley "Lion" and he appeared a few times in league matches until the middle of the following year when he took over the captaincy of Lea Bridge. The Southampton colours adorned him in 1939 and as World War II brought a closure to speedway, it also saw the retirement of "Father Gus". But he will always be remembered as a wily master of track-craft, a brilliant mechanic, a darned hard man to beat, and above all a thorough sportsman and a jolly good fellow, and what's more he was the first Englishman to try his hand at motorcycle ice racing with spiked tyres. Previously, in the middle of 1936, Gus opened his new motorcycle showrooms in Clapham Road, London, a business which still exists today . In the immediate post-war years Gus Kuhn's interest in trials riding still remained and although now a grandfather he competed in his old love the Victory Trial of 1946 his mount this time being a 490cc Norton. Gus had this to say in 1949. "My opinion is that the sport today is not half so fascinating as it was when I rode in the Stamford Bridge and Wimbledon teams. Even now, people come into my business to say how much they used to enjoy their Saturday nights at the 'Bridge' and they too emphasise the lack of personality in today's speedway racing. I think that speedway has been made too scientific: a rider can now have equipment second to none, and if he rides the same frame as the rest of the team he looks the same as them, whereas in my time every rider had his own style and supporters got to know him by it. That is why even now the few remaining leg-trailers remind the old-time enthusiasts how much more spectacular the racing was. "My greatest thrill? Well this was in a big event at Wembley in 1929, for the Gold Satchel, and I won my way through to the final, as also did Jack Ormston, Wally Hull and Harry Whitfield. Three times they tried to get us off to a rolling start. In the end we did get under way and I managed to beat Wally into second place on the last lap when he looked a definite winner." With its great tax on energy and fitness it would have seemed that trials riding demanded the comparative youth of its exponents. As a rule this has always been the case, but Gus, at the age of 52, rode again in the Victory Trial of 1951, and this time on a Royal Enfield. After being in poor health for some time Gus died on August 30 last, at the age of 67 years, and another pioneer joined the immortal band already passed on. He leaves four daughters and I understand that his Stockwell business will still continue. As long as the name of "GUS KUHN" conspicuously displays itself above the premises of 275 Clapham Road, in South-West London it will not only serve to perpetuate the name of one of England's famous old-timers, but also one of its greatest and truest sportsmen.